St. Anselm (c.1033-1109), archbishop of Canterbury, was a widely influential medieval philosopher and theologian, perhaps best known for formulating a theory which sought to prove the existence of God. In his 'Similitudes', also called 'Human Morals', he compares virtues and vices. Other texts in this volume include an account by Adam, monk of Eynsham, of a vision of purgatory and paradise experienced by his brother Edmund in 1196. The illustrations are exceptional because they usually attempt to illustrate abstract ideas, often in pairs, such as health and sickness, or strength and weakness. 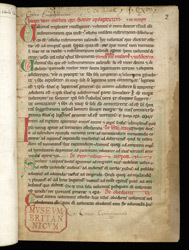 This manuscript belonged to the Cistercian Abbey of Dore, Herefordshire, by the 14th century, and it may have been written and illustrated there. The first page of the manuscript has three ownership inscriptions: in the top margin is the partly erased note 'The book of Dore Abbey, J. of Exeter', and in the top and bottom margins are two inscription of Robert Cotton (d. 1631) whose important collection of manuscripts was presented to the Nation in 1700.